No matter what one writes about, one will always be accused of generalizations and stereotypes. Perhaps that is why I chose my five Ns - Nice, No Thanks, Note-Worthy, Need and New to organize my closet and my writing and to provide a balanced cross-section. I also wanted to demonstrate through the posts and provide opportunities through the comments that one person's NICE is another person's NO THANKS! The striped top for the summer is the focus of this post, a NO THANKS for many because stripes tend to bring horizontal challenge to the physique. Yet, there are those fashion-oriented authors who attempt to write of French chic by presenting any striped top/shirt as tres chic, NICE in this post's vocabulary. Well, that's debatable. A moot case: A group of friends had gathered for dinner. Not only did two female guests, of whom I was one, arrive at exactly the same time, we were wearing striped tops, in classic black and white. 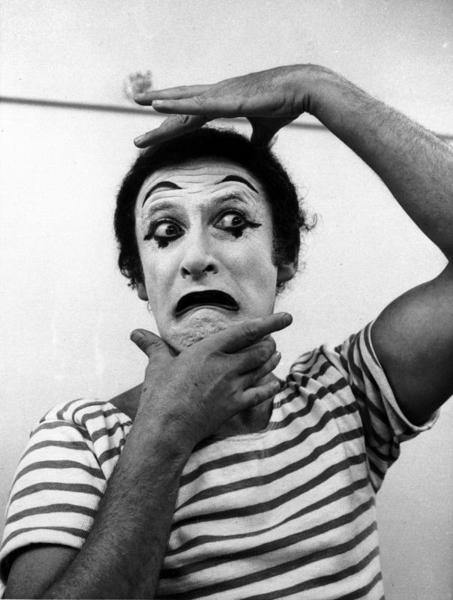 If I had thought I had any sense of chic, it was gone when our host asked us how the Marcel Marceau auditions went. Of course, we chided each other for the rest of the evening on this happenstance. And so, take your pick - clownish or French chic? That being asked, it is NOTE-WORTHY that stripes have held their own over the decades and manage to be fresh each summer. 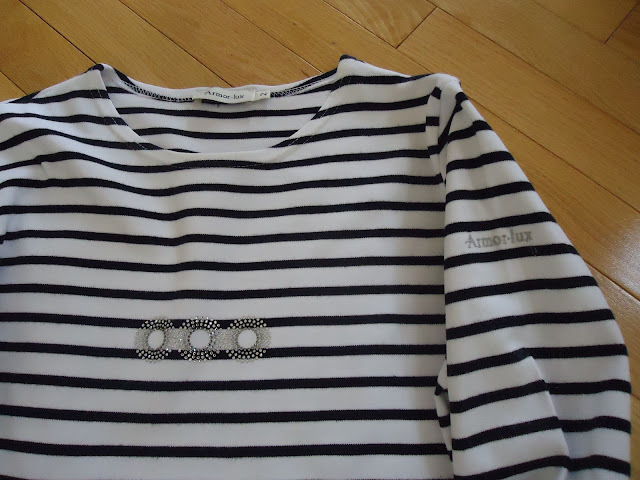 Armor Lux striped long-sleeved top with circular embellishments. 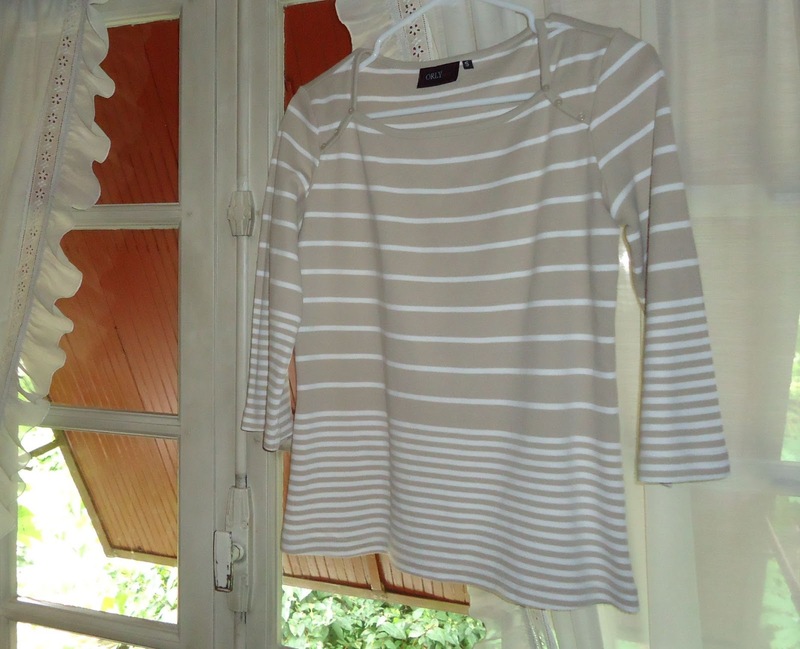 NICE 1: When in France or actually anywhere in the world you are, take the opportunity to buy an Armor-Lux striped top. Armor-Lux is a company from the French region of Brittany that has become famous for those sailor stripes - marinière. Apparently the stripes, worn by sailors, were easy to see if one was unfortunate enough to be washed overboard. Functionality precedes fashion and what was practical work-wear is now fashionable. 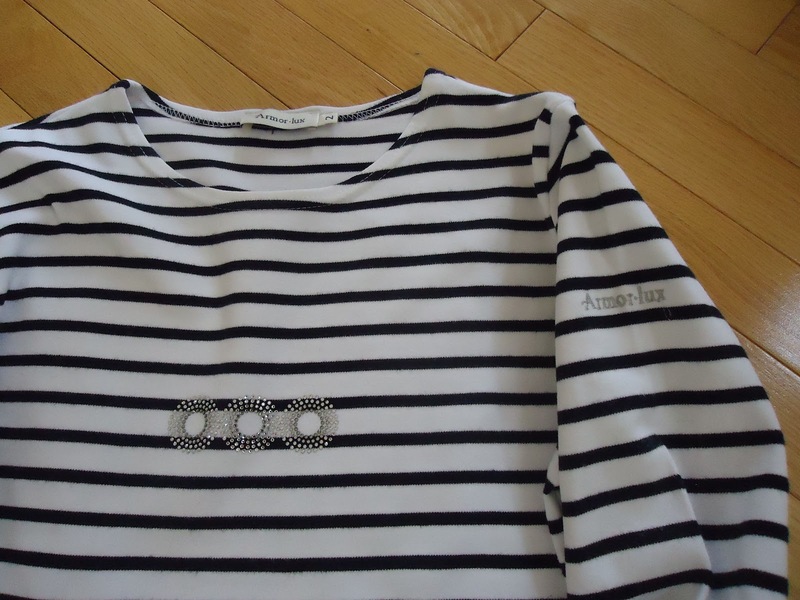 I bought this Armor-Lux long-sleeved top at the Marques Avenue outlet mall in Romans, France in 2010. In times past, celebrities who have worn la célèbre marinière are Pablo Picasso, Kirk Douglas, Jean Paul Sartre, Madonna, Brigit Bardot, and Marilyn Monroe. "Orly" beige and white striped top, hanging on my bedroom window. NICE 2: This one is not Armor-Lux, but I like it because of the subtly of beige and white. If you like stripes but shy away from them because of the "horizontal stripes make you look wider" notion, then try beige and white. More subtle, than black or navy and white and quite acceptable for the person who wants to lose a few pounds/kilos/stone before wearing stripes. Display of striped tops in a Canadian clothiers, April, 2012. NOTE-WORTHY: Striped tops without embellishment will take you from one season to the next; whereas, you can tell the year you bought the piece by the embellishment. However, if you are enamoured with stripes and buying at least one striped top is part of your summer clothing allowance, the embellishments can give you a myriad of choices in your summer wardrobe. NO THANKS: A friend, from France, was with me when I bought my first Armor-Lux top. I wanted to buy one without any embellishment but he convinced me, Frenchman that he is, that the one I bought with the three sparkly circles was more chic. I do like the one he suggested, but the next Armor-Lux top I buy will not have any embellishment on it. And to me, that is more chic, but then again, I am not French. NEED: An unembellished Armor-Lux light blue or beige and white striped top. Sounds like reason enough to take a trip to the south-east of France to shop at Marques Avenue or to Biarritz, closer to where I am, to shop at the boutique store there. Yes, I know I can shop online but in-store shopping is always more exciting and provides good reason to visit and re-visit interesting places and affords me the opportunity to practise my French. For me, it's as much the experience as the purchase! So if I don't get the opportunity to buy one this year, I have time; there is always next year. What a great article! Love your blog ! You always give me good ideas!